A vivid yellow structure makes for a powerful visual statement to folks traveling along the Tullamarine Freeway in Melbourne, Australia. Here's a relatively old image, at least as far as the world of digital photography is concerned. It features an architectural element and freeway undercarriage in Melbourne, Australia and was made below and adjacent to the beginning of the Tullamarine Freeway around sunset on a late Summer's evening in February 2006. Made with my very first digital camera, the Canon 5D, a 12.8 Megapixel full frame camera that, for its time, was a pretty amazing piece of kit. Back then I was a dedicated fixed (i.e., prime) lens user and this photo was made with my Canon 24 mm f/1.4 L series USM lens. I loved that lens and used it frequently, sometimes at its maximum aperture of f/1.4. The setting reminded me of the kind of location where one of those crazy car chases from the TV show Chips might have been filmed. Of course it's the introduction of the bright yellow structure in the top centre of the frame that draws the eye. Placed against the deep blue sky this structure adds a surreal quality to the image and juxtaposes a pretty funky, contemporary element against what, for some folk, would be a relatively unremarkable location. For me it's the yellow color of the structure, made particularly vivid by the sunset, that reveals the transitory beauty of the location. Making photos at such times of day is good for the soul. I think that's because the process of making art forms a connection between location, artist and viewer that is pure and honest. The fact that, during the making of the image, time seems to move at a different rate suggests another kind of connection all together. And perhaps that's the greatest joy there is for the photographer. 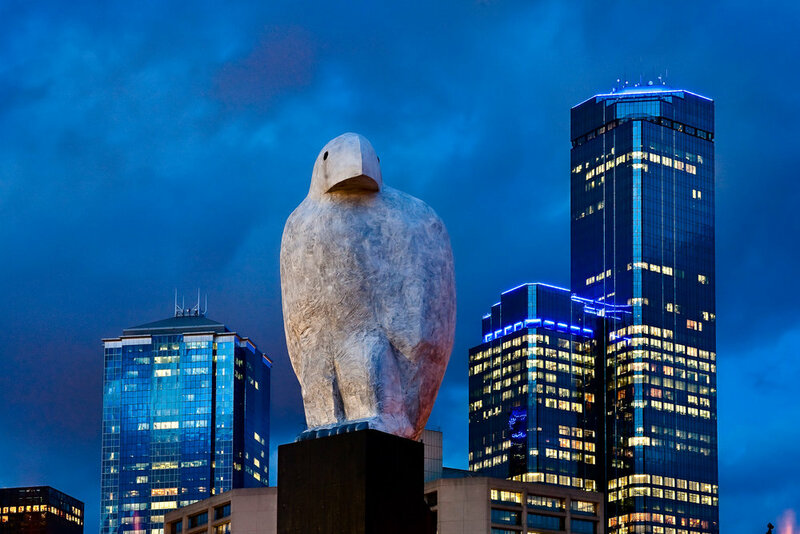 A giant owl statue perched high amidst the Melbourne skyline. Being a big city there’s lots to photograph in Melbourne, including architectural elements. I photographed the statue of the owl at dusk on a stormy evening near Southern Cross Railway Station. I like the yellow and blue color contrast that serves to frame the statue and the stormy clouds gathering in the background. A self portrait of Glenn Guy, the Travel Photography Guru, in silhouette at Docklands in Melbourne, Australia. While photography is always fun and can be undertaken in exotic locales, more often than not the secret to making a good photo is to be able to work with less than inspiring subject matter. The notion of making something out of nothing is central to how I approach photography. It’s not so much what’s around you, but the potential in what you see and your ability to translate your vision into form. The notion of finding beauty in the banal is at the heart of the philosophy that underpins my own photography.